This recipe is at the request of Emily, who got in touch to ask for this recipe for her nan after watching me talking about the Made in Spain book at Lorraine"s.
Valencianas are elongated cakes. The whole point of that shape is that you normally dunk them in hot milk for breakfast. It is actually very difficult to buy the long paper cases in the UK so we did them mini-loaf paper cases instead. There are lots of recipes in the internet, all very different. We had to phone a friend of mine from Valencia to find the closest one to the real thing ( which is normally shop bought in Valencia from any of the fantastic bakeries there). 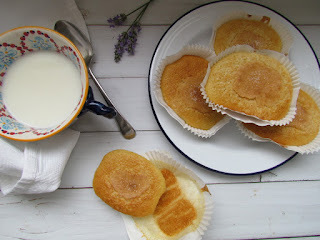 This one comes from http://recetastradicionalesdecocina.blogspot.com.es/2014/07/receta-de-las-magdalenas-valencianas.html. We have only adjusted the quantities a tiny bit. The children loved them and they really make your kitchen feel wholesome.